“You should read this book,” Marguerite – the owner of In His Name, our local Catholic book store – told me. She has started a section of North Carolina writers, and Richard’s book was right next to mine. She knows books, and when she recommends one, I read it. I’m glad I did. Tobit’s Dog is a wonderful, engaging story. I picked it up and read it right through, thoroughly enjoying every moment of it… This is a wonderful, wise story. Catholicism is woven into it in a way that makes apparent the incarnate nature of our faith. You can read the rest of Mr. Power’s review on CatholicFiction.net. 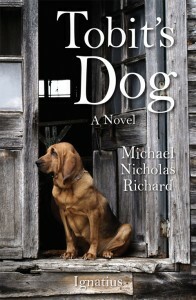 It’s hard to believe that Tobit’s Dog is Michael Richard’s first novel, considering how engaging it is. The story slips easily from character to character, starting with the titular dog Okra and ending with Tobit’s son Tobias. Each one has a distinct point of view, but the connections between them are tightly-woven…. Supernatural elements might seem unbelievable in a contemporary setting. However, the environment in Tobit’s Dog is so firmly anchored in reality that an angel has as much weight and dimension as an auto mechanic. The full review can be found on Jean’s blog The House of Nonsense. This book is quite an education in the history, ideology, religion, and geography of the two world wars…Detailed and well-researched, the story brings war in its brutality as well as the courage it’s often met by to life. Even more beautifully it skillfully reveals the effect that our beliefs have on ourselves and others, the grave weight that ideas hold, and the horrors that arise when the truths written in the human heart are denied. The rest of Meg’s review is on her blog Heaven’s in Your Corner. This is the fourth book by Lucy Beckett I’ve read, all published by Ignatius Press…. The Leaves are Falling needed more such moments to exalt the true dignity and freedom of the human person beyond discussions of political systems. For all the human tragedy depicted in The Leaves are Falling, I was not involved in the life of Josef Halpern because he was not fleshed out as a person beyond being a character and vehicle for discussion of the past or even of the errors of the present. Jacob Halpern emerges more fully as a person, growing in awareness, coming closer to something great. He becomes the hero of his story; his son does not. Stephanie Mann’s full review can be found on her blog Supremacy and Survival. I can not wait to tell you how much I loved it, but first I must beg you all to get a hold of it and read it pronto. 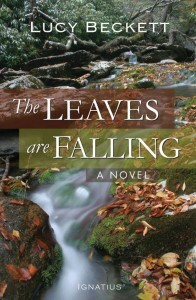 You see, I need everyone to read this book so I can talk to you all about it in great detail….I have never read any of Lucy Beckett’s work, but if it’s anything like The Leaves are Falling, she has a new devoted fan…What I loved about Beckett’s work was the level of depth she gave her characters. Despite this tragically hard story line, there were moments of grace, of lightness, of laughter from those in the story, which I appreciated. It’s very easy to make characters as sad as their experiences, which would have left this book very flat and one dimensional. The character of Josef was by far my favorite. I wanted to reach into the book and just hug him until we both felt better…. Virginia and Kara’s review can be found on their blog Mea Cuppa. They have also reviewed The Rising and Tobit’s Dog.